US futures are pointing to a lower open in the stock market today after ending higher on Monday. Investors are cautious ahead of the first semi-annual monetary policy address by Federal Reserve Chairman Jerome Powell. Traders are expecting the Fed Chair to clarify the current US economy state, monetary policy, shed light on inflation and the pace of interest rate hikes. The S&P futures slipped 0.16% to 2,780, Dow futures declined 0.14% to 25,722 and Nasdaq dropped 0.16% to 6,988.50. Elsewhere, shares at Asian markets closed mostly higher on Tuesday, while European stocks are losing ground. On the European economic front, data from statistical office INE showed that Spain’s consumer prices advanced 1.1% annually in February, quicker than 0.6% growth seen in January. The European Commission survey data showed that Eurozone economic sentiment index fell to 114.1 in February from 114.9 in January, due to decreases across all sectors except for services. Istat data revealed that Italy consumer confidence index inched up to 115.6 in February from 115.5 in January. According to Insee data, France consumer sentiment index fell to 100 in February from 104 in January. Data from the Central Bureau of Statistics showed that Dutch producer confidence index advanced to 10.9 in February from 10.3 in January. On the Asian economic front, survey compiled by the ANZ Bank and Roy Morgan Research showed that Australia’s consumer confidence index rose 2.3% to 117.9 in the week ended February 25 from 115.3 in the preceding week. The Census and Statistics Department data showed Hong Kong’s foreign trade deficit widened to HK$31.9 billion in January from HK$12.3 billion last year. On February 26, US ended higher, with Dow up 1.6% to 25,709.27, Nasdaq up 1.2% to 7,421.46, and the S&P 500 advancing 1.2% to 2,779.60. 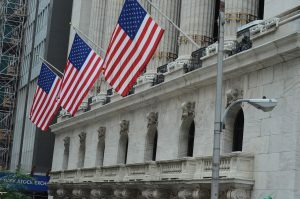 The Wall Street rallied due to a continued drop in treasury yields despite the dovish comment from St. Louis Federal Reserve President James Bullard. Traders are expecting the Fed Chair to clarify the current US economy state, monetary policy, shed light on inflation and the pace of interest rate hikes. Data from the US Commerce Department revealed that new home sales fell by 7.8% to an annual rate of 593,000 in January, while economists predicted a sales jump of 3.2%. In December, new home sales slipped by 7.6% to an upwardly revised 643,000. 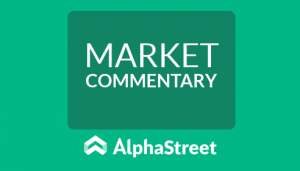 Meanwhile, key economic data that will be released today include the Commerce Department’s durable goods orders, Census Bureau’s international trade in goods, S&P Corelogic Case-Shiller HPI report, Redbook data, and conference board’s consumer confidence. On the corporate front, Akorn stock plunged 33.95% in the premarket after Germany’s Fresenius SE said it could drop a planned $5 billion takeover due to a probe into possible data breaches at the generic drugmaker. Comcast stock fell 2.60% in the premarket after it challenges Murdoch’s Fox with $31 billion bid to buy British broadcasting group, Sky. Fitbit stock tumbled 13.36% in premarket trading after posting first quarter outlook below street expectations. Shares of Toll Brothers rose 2.92% in premarket after better-than-expected first quarter earnings. Tenet Healthcare stock jumped 7.76% in premarket after bigger-than-expected fourth quarter earnings. Mallinckrodt stock climbed 11.18% in premarket after upbeat fourth quarter results. Akorn stock plunged 33.95% in the premarket after Germany’s Fresenius SE said it could drop a planned $5 billion takeover due to a probe into possible data breaches at the generic drugmaker. On the earnings front, Macy’s, AutoZone, Discovery Communications, Toll Brothers, Express Scripts, AES Corp., American Tower, Perrigo, Priceline Group, EOG Resources, Albemarle, Sempra Energy, Square, Weight Watchers, Hertz Global, Camping World, Steve Madden, SeaWorld and Papa John’s International are the key companies due to release their earnings today. Crude oil futures is down 0.42% to $63.64. Gold is trading up 0.10% to $1,334.10 and silver is up 0.17% to $16.65. On the currency front, the US dollar is trading down 0.01% at 106.984 yen. Against the euro, the dollar is up 0.03% to $1.2317. Against the pound, the dollar is down 0.19% to $1.3939.